Mexico has been described as the deadliest country for reporters outside of a war zone. 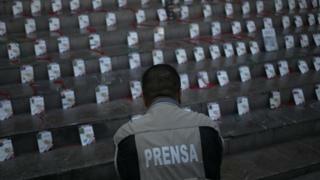 Since 2000, at least 144 journalists have been murdered according to Mexico's National Human Rights Commission (CNDH). Only Afghanistan and Syria have seen more reporters killed. Shortly after he was sworn in on 1 December, Mexican President Andrés Manuel López Obrador, or Amlo for short, said he would put an end to the murders - but at least five journalists have been killed since he took office. One of them was Rafael Murúa, who was murdered on 20 January despite having been in a programme offering protection to journalists deemed at risk. His body was found by the side of a road 24 hours after he been reported missing. He had been stabbed and shot in the head. Mr Murúa had been placed under the protection programme - created by the federal government in 2012 - after he had received threats. Who is Andrés Manuel López Obrador? Can Mexico save its journalists? But his relatives say that even though extra security measures were meant to be installed at his home, the works had not been carried out fully by the time of his disappearance. "For the mechanism to have one of its beneficiaries assassinated is very bad news," says the representative of the United Nations High Commissioner for Human Rights in Mexico, Jan Jarab. In the wake of Mr Murúa's killing, the federal government ordered a general review of the scheme to improve its functioning, its head Aarón Mastache said. Mr Mastache has also asked for increased funding to enhance the protection granted to its 798 beneficiaries, of which 298 are journalists and relatives of journalists. Mr Murúa was the third journalist murdered since the Amlo administration came to power, but the risks faced by media workers in Mexico are anything but new. Journalist and activist Moisés Sánchez Cerezo was taken from his home in the the state of Veracruz - considered among the deadliest in Mexico for reporters - on 2 January 2015. At least six armed men broke into his house and snatched him away from his wife and two grandchildren. He was held hostage and tortured for three weeks before his body was found dismembered near Medellín de Bravo, the rural town near where he had worked and lived. For decades, Mr Sánchez Cerezo had published a newspaper called La Unión: La Voz de Medellín, which he distributed himself in a car he rented to work as a taxi driver. He also used social media to post his reports about irregularities in the municipal police force. "My father always fought for justice. He reported on criminal activities, and on what was wrong in the municipality," his 33-year-old son Jorge Sánchez Ordoñez told the BBC. Investigators say it was his critical coverage which got Moisés Sánchez Cerezo killed. Three men have been convicted for their role in his murder, two of them were municipal police officers at the time of his murder and the third was the bodyguard of the town's mayor. The former mayor himself, Omar Cruz, is on the run. He is suspected of having ordered the murder. "We live in fear knowing that he is still out there," says his son, who now runs the digital version of his late father's newspaper. "There has been a lack of political will from the current and previous federal governments to solve this and other cases." Mr Sánchez Ordoñez is not the only one demanding the government do more to go after those who kill journalists. Griselda Triana's husband was award-winning journalist Javier Valdez, who was murdered in 2017. Mr Valdez was dragged out of his car by gunmen who shot him dead a few metres from the newsroom of Ríodoce, the weekly newspaper he had co-founded in 2003. His murder sent shockwaves through Mexican society, fuelling protests across the nation. Two men with links to the Sinaloa drug cartel have been arrested and charged with his murder but Ms Triana, who fled Sinaloa after the murder, says that the people who ordered his killing remain at large. "While those responsible remain unpunished, I will not be completely satisfied, because that is what all of those whose relatives have been killed demand: justice," she told the BBC. A recent report by Article 19, a freedom of expression pressure advocacy group, suggests President López Obrador faces a huge task. According to the report, 99% of attacks against journalists have gone unpunished and state actors were "directly or indirectly" involved in at least half of the cases documented in 2017. The director of Article 19 for Mexico and Central America, Ana Cristina Ruelas, thinks that so far the actions Amlo's government has taken are merely "symbolic". "There still haven't been actions that lead us to think that things will change," she told the BBC. Mr Jarab says President López Obrador has shown "goodwill" in his efforts to protect reporters, but that despite that, journalists and human rights defenders have been murdered at a higher rate since he took office. The UN official says that Amlo came to power in the midst of a "human rights crisis" characterised by "dramatic violence" and recognises that "it will not be easy to resolve all these difficult issues". And he warns that "it's still overall a very, very bleak picture" for reporters in Mexico. Who is Mexico's Andrés Manuel López Obrador?